Chair Janet Kolodzy created a bridge to visually represent the new steps in the program. The journalism department tested out a new curriculum focused on student needs and industry expectations this semester. This year’s freshman follow different steps to receive a Bachelor of Science in journalism while returning students will fulfill the previous degree track with new and improved classes. Only students enrolled in the college for Fall 2017 or later will see a change reflected on DegreeWorks, but department chair Janet Kolodzy said everyone in the program should reap the benefits. The new curriculum is “learner-centered,” meaning it focuses less on the content of a course and more on whether a student learned specific skills needed for their career, Kolodzy said. For example, the degree previously included a public affairs pod and cultural pod—meaning students must take classes focused on each of these topics. More skill-focused requirements like “Profiles/In Depth Journalism” and “Enterprise Journalism” replaced the pods to reinforce the tangible competences students must acquire to succeed in the field, she said. “Often students viewed the curriculum as a checklist. The point of those [pods] was aiming to provide students with a mix, but I think they became more burdens than opportunities,” Kolodzy said. 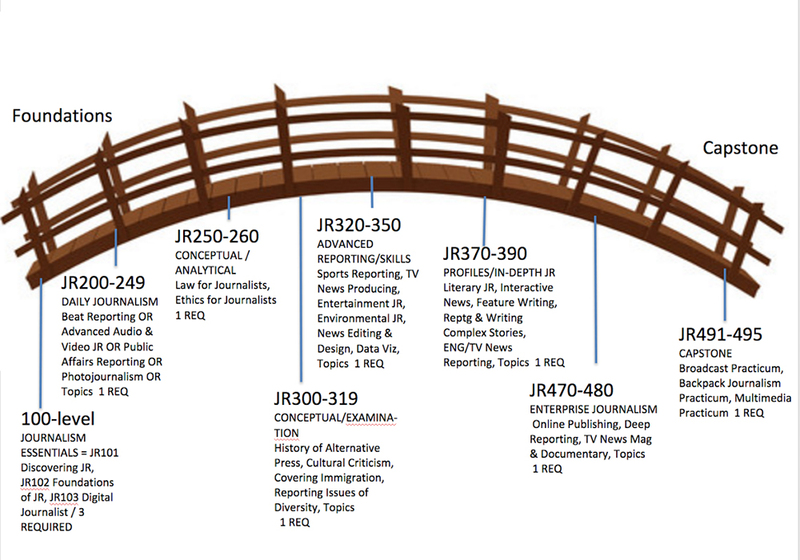 Other adjustments include the removal of the U.S. Government and Politics course, a total restructuring of the Beat Reporting class, and the addition of an interdisciplinary journalism course through the “Journalism Diversity” requirement. Each step of the new curriculum is defined by specific learning outcomes, outlining the skills students should acquire from whatever course fulfills the requirement on their degree. Kolodzy said she hoped this structure would allow a more flexible and personalized experience. “Regardless of which course you take [to fulfill a certain requirement], there should be a certain sense of what our students are going to get out of this course,” Kolodzy said. The “Advanced Reporting/Skills” learning outcome states that students should learn to pitch public interest stories and analyze related data in whatever course fulfills this requirement. Kolodzy served as the chair of a committee that spent two years researching and working to improve the program. The last curriculum update occurred five years ago and the department needed to adapt to the ever changing field, she said. Raul Reis, dean of the school of communication, said rapidly changing technology impacts journalism most out of all the communication disciplines. Reis said he hopes other departments adopt the unique learner-centered approach. Sophomore journalism major, Kayce Mckee said she thinks the curriculum needed to be updated considering how journalism is changing under President Donald Trump. Mckee said she doesn’t know what type of journalism she wants to focus on and thinks the new curriculum could help other students in her position.